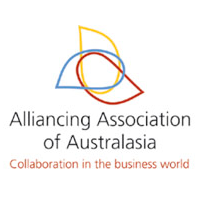 More than 12 years of alliance contracting in Australasia’s public infrastructure sector has yielded a range of relationship-based models to successfully deliver projects. The Early Contractor Involvement (ECI) contracting methodology in Australia is a unique form of collaborative contracting, inspired by the UK’s Highways Agency. ECI contracting has rapidly gained popularity since Queensland’s Department of Transport and Main Roads undertook its first ECI pilot project in 2005, the Maroochy River Bridge Duplication. It has since been used throughout Australia and according to supporters, is applicable to any civil engineering field. As an alternative to traditional design and construct contracts, ECI contracting enables risk to be allocated by negotiation to the party genuinely best able to manage and bear it. The designer and constructor work together in a contractual relationship with the client, firstly to scope and price (Stage 1) and then to design and construct a project (Stage 2). Industry support for this two-stage process is strong as it allows constructability to be built in from the start, unlike standard contracts where bids must conform to a prescribed method and defined design. Design time savings are also possible when the contractor, designer and owner work together to design the job once; compared to traditional procurement where time is required after project award to consider, develop and finalise any alternative design ideas. 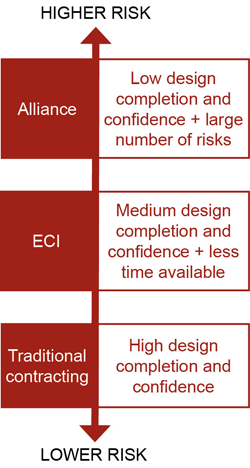 Risk profile is a key factor influencing use of ECI contracting. While alliancing is most appropriate when there is a high degree of uncertainty in both the development and delivery phases, ECI allows for a smaller number of initial risk uncertainties to be removed so parties can agree to a realistic risk adjusted price. A lower level of design completion and confidence is another factor, as value for money can be achieved through early contractor involvement in design and pricing. ECI contracting is also useful when there is a risk of not obtaining competitive tenders using other traditional procurement methods. Incentivised ECI contracts have emerged in design and construction stages when bonuses can be payable to contractors based on savings against both budget and the agreed price. The opportunity to share in savings is generally accepted as a step in the right direction to develop ‘best for project’ solutions for traditional contracts. It rewards teams and owners who work together to explore upper and lower limits of what can be achieved within specifications to save time and cost. All costs and documentation are transparent and the decision-making process allows for discussion and deeper understanding of project requirements. Contractors benefit from greater financial certainty, as their margin is secure, and this in turn reduces the likelihood of margin recovery strategies such as claims. Greater certainty encourages more flexibility and commitment to win-win behaviours. Price competition is also gaining a foothold via selection of multiple teams to participate in the scoping and pricing stage. Up to three bidders have been shortlisted to design and price a scheme. Generally, contractors report a preference for two rather than three consortia for the competitive Stage 1 as it reduces interfaces, costs and the drain on resources for both client and contractor. And where private sector owners use ECI contracting, the trend is to a sole source or single tenderer selection, allowing depth collaboration through design and construction.